Governor's Candidate Dan Rutherford Can't "Loose"
Seems like everyone is trying to emulate the Truth Team’s favorite candidate, Bob Grogan, err I mean Bob Grogran. 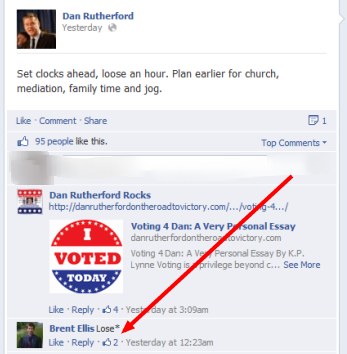 Check out Illinois Governor's candidate Dan Rutherford pulling his best Bob Grogran by giving us a strange Facebook post about daylight savings time that we've posted above. "Set your clocks ahead and loose an hour?" ...And how about the fact that 95 people liked this post and only one was kind enough to try to alert him to his error?!? Now that we think about it, we're guessing a guy like Bruce Rauner could make a pretty penny investing in an autocorrect feature for politicians.